The Menino Arts Center offers something for everyone, at any age. MAC presents hundreds of classes, demonstrations, lectures and special events annually. With over 4,000 square feet of space, the MAC is home to a large classroom, seven affordable artist work studios, three galleries, a library and resource center, an auditorium and our organization’s home offices. 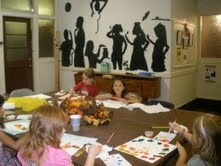 Please check the website for: current class offerings, or call 617-364-ARTS. Summer Arts Weeks are available for kids ages 7-12. Classes for all resume in the fall. The Menino Arts Center supports local artists and makes cultural opportunities accessible to families and individuals in the community. Art classes are taught year-round for people of every age and ability.